Tonight was one of those nights where I was tasked with putting together a dinner and there was no chance to shop- it was a ‘use up what’s in the house’ type dinner. Luckily there were some nice bits and piece lying around. 5 cloves of garlic. Crushed. I started off by heating some olive oil in a pot. Peel the chorizo and chop it into whatever size you like, you’re the one who is going to be eating it. I prefer a smaller dice for dishes like this one. Fry it in the oil until it is crisp. Remove the chorizo, keeping as much of the oil in the pot as possible. Throw the chicken in and fry until it is sealed. Set aside the chicken with the chorizo. Into the pan add the garlic, fry until slightly coloured. Then add the tin of drained chickpeas. When they have started to sizzle- add glug 1 of the dry sherry into the pan. After frying for a short while- add the chicken and chorizo back in. At this stage add the two tins of tomato. At this stage add glug 2 of the sherry, the tomato purée, and season with salt and pepper. I also added a little pinch of sugar. I gently simmered the whole lot for about half an hour. I also happened to have a few stray green beans in the fridge so they were chopped and thrown in. I served it with some brown rice which soaked up the juices very nicely. Apologies for the lack of posting in recent weeks- I had the small matter of some exams to do. They are now over and back to blogging! I finally got to eat in Pichet last night. Since it has opened I have heard nothing but good things, and often from people who are tough to please. Upon arriving the staff really made an effort to welcome you to the restaurant, a little touch but it made us feel that we weren’t just another cover to them. The restaurant surroundings are very pleasant, and made for an enjoyable setting for the evening. The early bird menu ended up enticing us all, but I must mention that at something € mid-forty region the tasting menu could be superb value also. Bread was served with balsamic and olive oil, which I always appreciate as a non butter-eater. I started with the terrine, which had a wonderfully soft texture and was packed full of flavour. It was served with a nice wedge of toasted bread and a few salad leaves. The fig purée provided a nice hint of sharpness to the terrine. My dining companions went for the spring onion risotto (which they said was delicious- and was quite a generous portion). My better half went for the celeriac velouté, which came with a tortelloni of short back ribs, which apparently was also very enjoyable. Two of us opted for the short back ribs for our main course. They were incredibly tender, and came with a horseradish mousseline and some wilted spinach topped with some superb onion rings. They worked very well together, but I would have liked more of the mousseline and spinach. The roast chicken was the other choice at the table and was incredibly flavoursome and succulent. Desert was by far the stand-out course. Two of us opted for the white chocolate mouse, which came with raspberries in syrup, cubes of raspberry jelly and the best sorbet I have tasted. It was also raspberry. This redeemed my faith in sorbets after a hideous raspberry sorbet experience recently. You will hear about that soon. 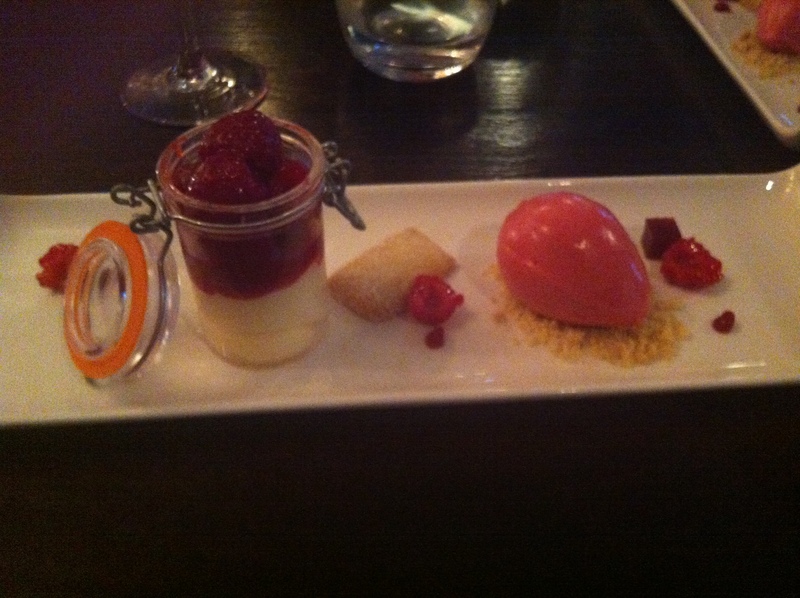 The other desert that was chosen was salt caramel ice cream with various accompaniments. Approving noises were made with regards to this also. Dinner was rounded off with a very good espresso. A nice touch to round off the very strong service was being asked did we want our coffees with or after desert. It is nice not to get chased out of a restaurant at an early bird sitting. Equally when we enquired about sides with our mains, they said we would probably be fine- rather than the nearly obligatory up-sell. With regards to the wine-list, there is some very good value. You won’t go wrong in Pichet. The food and service are very strong. It certainly lived up to its reputation. I look forward to returning. It’s that time of year, pumpkins are everywhere!! This year, I thought I would do something a bit more than just using them for decoration. 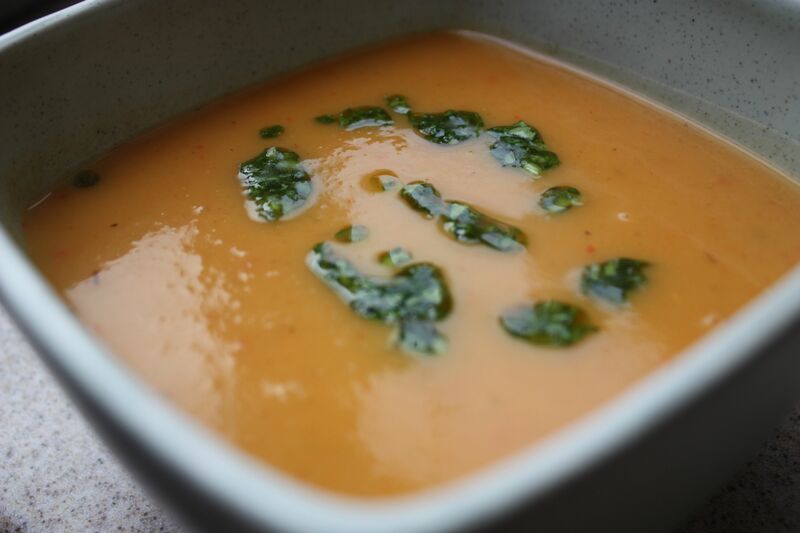 This soup is so simple to make, and with the peppers and coriander it’s a real warmer-upper as the weather dives towards freezing. First thing to do is to heat your oven to 200 degrees Celsius. Then peel the pumpkin and scoop out the seeds and core. I found the easiest way was to cut it into slices as you would with a melon and deal with it piece by piece. I then chopped it into smaller pieces for roasting. Add the pumpkin to a roasting tray with the de-seeded sliced peppers along with the four cloves of garlic which I left whole. Drizzle with olive oil and season with salt and pepper. Roast for about 40 minutes. 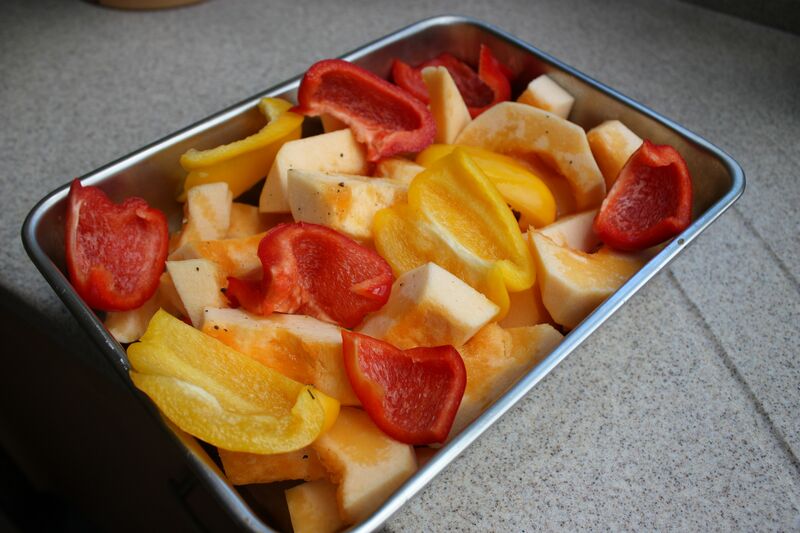 About 10 minutes before the pumpkin and peppers are due to come out of the oven, in a large pan, heat some olive oil. Add the chopped onion and celery and cook until they have softened but do not let them colour too much. When the pumpkin and friends are done in the oven, add the stock to the pan before tipping in all the roast stuff. Cover and let it bubble away for 30 minutes on a low heat. While this is cooking you can prepare the coriander drizzle. Wash the coriander and dry on some kitchen paper. Finely chop it, until it’s nearly minced. Place in a bowl and add a good glug of chilli oil. If you don’t have chilli oil, normal olive oil is just as good. Season with a little salt and pepper. You want a consistency that will just fall of the spoon. When the soup mixture is finished cooking, blend until smooth, as you don’t want any lumps of garlic lurking in your soup! Serve in warmed bowls and drizzle some coriander over the top with a spoon for a little extra kick. This recipe was the product of a few factors last weekend. Leftover cooked chicken, a very cold evening and a desire to cook something incredibly straightforward. Bonus about this recipe is that it doesn’t create mountains of washing up. Firstly heat your oven to 180 degrees Celsius. In a large pot, bring salted water to the boil. Add the pasta and cook until very al dente. If you are using frozen spinach, start thawing this out in a small pot with a tiny drop of water. When the spinach is cooked- drain all liquid from the pot. I had to supplement the cooked chicken I had, so heat some olive oil in a pan and add the raw chicken, cut into small cubes/strips. After the chicken has sealed, add in the mushrooms and fry until the chicken is golden and cooked. To the same pan add the cream, cream cheese, thawed/fresh spinach, garlic and mustard along with the leftover cooked chicken if you have any. Heat until it bubbles and is well combined. When the pasta is cooked sufficiently, drain it and return it to the pot. Add the sauce mixture to it and stir well until all is combined. Spread into an oven dish and cover with a generous grating of cheddar. Bake for 25 minutes or until golden. On a side note- thanks to all who have subscribed. If you haven’t please do! I would really appreciate people sharing these recipes, tweeting or telling friends and family- share the silver chicken word! 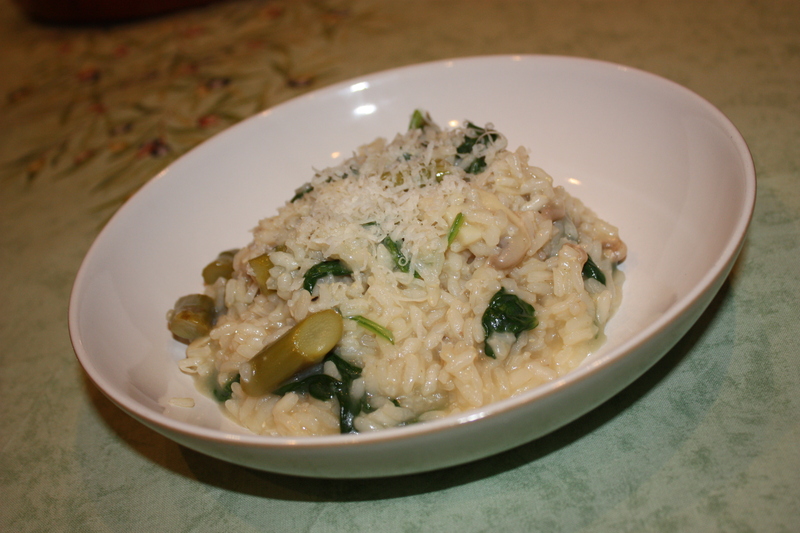 Risotto is one of my favourite comfort foods, and can be adapted for any season by varying the ingredients. The basic recipe is the same no matter what you put in, so if you wanted to change it, you would substitute your preferences in for the vegetables I have listed. I would like to deal with the hype about how risotto is insanely difficult to make or it can go wrong easily. It is an easy dish to make, but I feel there are three success factors. First, have all your ingredients, stock etc, measured and ready to go, so that you can concentrate on the cooking. As many of my friends will testify, this is not my normal style of cooking- but I feel it pays dividends here. Of course by cooking I meant stirring. You need to constantly stir the risotto. Do this gently, but make sure you are scraping the bottom of the pan and mixing thoroughly. Thirdly, have the risotto at a constant low heat so that when the liquid is added it is just bubbling gently. First heat the olive oil and the butter in a deep pan. After they have heated add the onion and sweat it off, until it softens a little. At this stage add the garlic and fry for another while. Before the garlic gets too coloured, throw in the chopped mushrooms and asparagus and toss in the mixture. I recommend chopping these into bite-size pieces. Fry for a minute and then add the rice. Make sure everything is well mixed. Continue to cook for another minute while the rice lightly toasts, but make sure that you stir constantly so that it doesn’t stick. Next add the white wine. I would advise buying a whole bottle- not a small one- this way you get to pour yourself a glass while cooking and have one with your meal. Stir until the wine has been absorbed by the rice. If it smells a little acrid, don’t worry, the alcohol will burn off leaving a great flavour in the rice. At this point add in the first third of the stock- I would recommend vegetable or chicken. Keep the risotto barely bubbling and stir until all the stock has been absorbed and the mixture is thick and slightly heavy to stir. Add in another third of the stock and repeat the process until the stock is absorbed. Add in the final remainder of the stock and repeat. As the final third of the stock is close to being absorbed- add in the spinach and stir in. Once the mixture has thickened sufficiently, turn off the heat and serve into heated bowls immediately. Serve with some grated parmesan and that glass of wine. For the carnivores amongst us, you can serve this risotto alongside some grilled meat. I recently enjoyed it with some steak. Another option is to shred some cooked chicken in at the spinach stage- and just heat the chicken through.